I loved Phil Jimenez’s run on Superwoman. Honestly, since K. Perkins took over, I haven’t hugely enjoyed any issue of this book. Well, until this one. 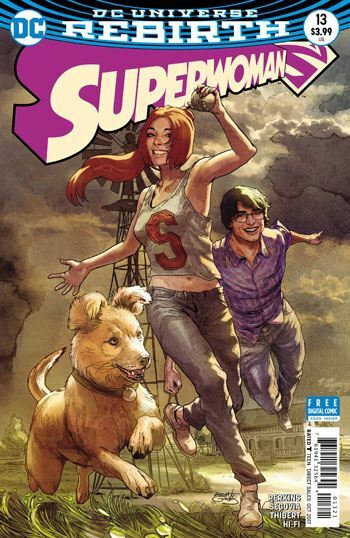 A new villain for Superwoman gets introduced, Red Sun, and is retroactively worked into the youthful lives of Lana Lang, Clark Kent and Lex Luthor. Lex went to school with the other two, as it used to be back in the Silver Age. And as it turns out, so did Red Sun, when he was simply Amos Aimes. In the present day, Lana heads back to Smallville to try to gain some insight into her powers, which are proving to be more complex in origin than she had believed. Amos, now Red Sun, has developed an armour based on red kryptonite, and uses this to turn Superwoman into a rampaging threat. Lex Luthor winds up playing the hero, trying to stop Superwoman. It’s one of Lex’s more noble appearances, and seeing him play the hero, for real, is always impressive and refreshing. This gets intercut with extensive flashbacks to the high school days of the characters. This really helps build the characters. Lana finds the rebellious Amos interesting, which infuriates Clark. Lana and Clark have enjoyable, and realistic, juvenile romantic troubles. There is some charming interplay between Lana and Lex as well, with the pair coming into conflict in a science class, Lex never willing to concede that anyone could possibly know more than he does. These scenes really improve the issue. Sure the action is important, and the tale does not lack in that element. 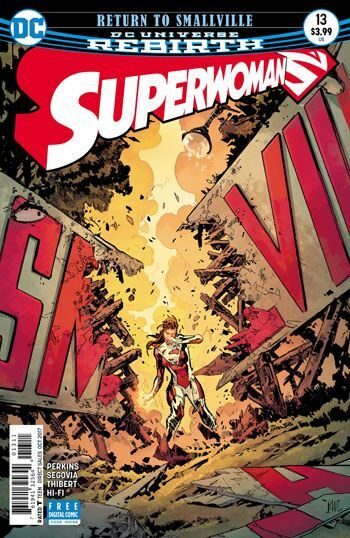 Red Sun provides a new angle on red kryptonite, and the final page sets up an awaited confrontation for Superwoman. But it was the real characterization in the flashbacks that made me genuinely appreciate the issue.